By harrisonca on July 16th, 2009 . Filed under: Clothing, Kids, Shoes . 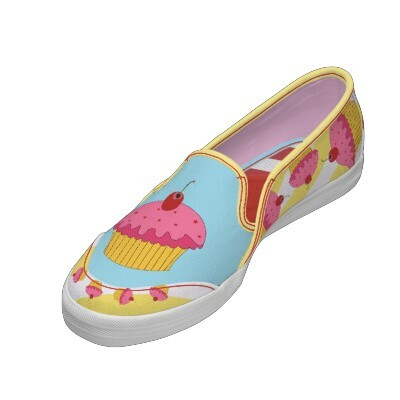 Thanks to Libby for pointing these highly customizable cupcake kicks available at Zazzle.com. With over a hundred designs of shoes to choose from, you are bound to find something suitable for a special occasion. What blew my mind was that each shoe design can be personalized and customized. You can choose your own personal colors for the stitching, midsole, lining, upper binding, insole binding, and more! This is taking a step above other cupcake shoes. I love it! I want some but don’t know which ones to chose, this could be a week long decision! This is awesome!!! I want all of them! I would like to purchase one or two pair of shoes – how do I go about that – I would need them in a week.